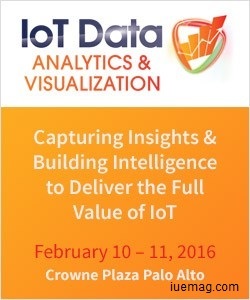 IoT Data Analytics & Visualization taking place on February 10 – 11 in the Crowne Plaza, Palo Alto, is the first dedicated event to tackle and showcase the ways in which companies can evolve their strategy and focus from just connecting things to capturing insights in order to achieve true value from IoT. With two days of high level networking and learning opportunities, the event will bring together senior level representatives to share ideas, solve problems and create new business partnerships. Any facts, figures or references stated here are made by the author & don't reflect the endorsement of iU at all times unless otherwise drafted by official staff at iU. This article was first published here on 11th December 2015.